When entering the world of Rick Michel, you will be carried away to a place of continuous creativity. Performing for over 4 decades Rick has gone to school on all of the entertainers he has performed for and with. Michel has done it all in the industry from being featured on the #1 show in the world Baywatch (especially written for his impressions), Written a book about the "Do's and Don'ts" on stage. Producing over 6 Variety shows, including the best Frank Sinatra impressionist in the industry, and even created a song (Witness to My Journey) which can be downloaded FREE with subscribing to his newsletter. All of this and Rick finds time to give back to many charities to share the gift he was given. Hear all of the American Songbook hits that made Frank Sinatra one of the greatest singers of the 20th Century with the best Frank Sinatra singer. Specifically written for the Symphony/Pops but also can be conformed for a Big Band Orchestra. Classic songs and comedy make up this dynamic duo a must see show for any occasion. “Me and My Shadow” is a time-travel tribute to the standing room only shows when Frank Sinatra and Sammy Davis Jr. entertained audiences with their awesome talent and unpredictable high spirits. Ask yourself, "How would these Three Timeless Entertainers re-invent "COOL" today? 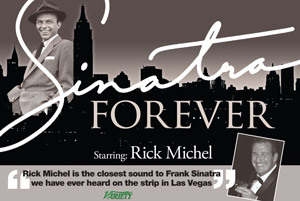 With over 200 voices to his credit, hear Rick Michel do singing impressions as well as his standup comedy celebrities.